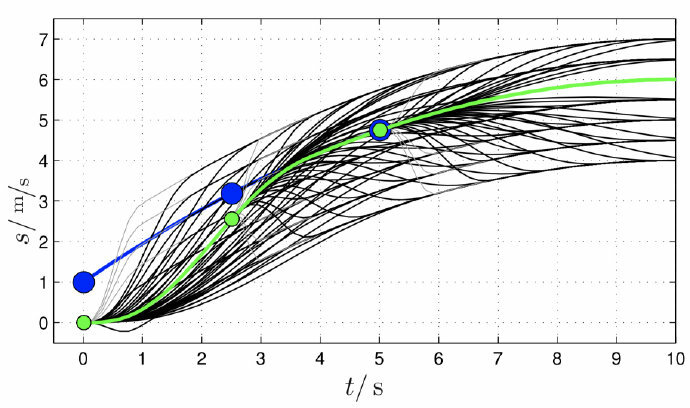 Differences between high speed and low speed trajectory generation. Implementation of specific maneuvers relevant to highway driving like following, merging, and velocity keeping. How to combining lateral and longitudinal trajectories. A derivation of the transformation from Frenet coordinates to global coordinates (in the appendix). , , , : fail to model the inherent unpredictability of other traffic, and the resulting uncertainty, given that they rely on precise prediction of other traffic participant’s motions over a long time period. 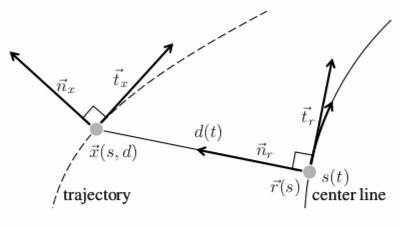 , , : The trajectories are represented parametrically. 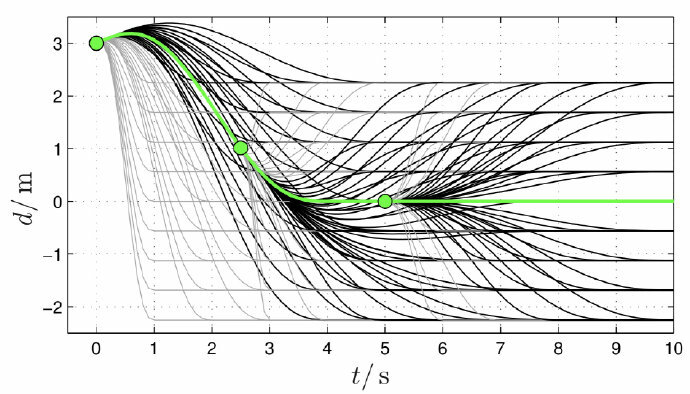 A finite set of trajectories is computed, typically by forward integration of the differential equations that describe vehicle dynamics.While this reduces the solution space and allows for fast planning, it may introduce suboptimality. : a tree of trajectories is sampled by simulating the closed loop system using the rapidly exploring random tree algorithm . : in a similar spirit to our method but only considers the free problem that is not constrained by obstacle. We propose a local method, which is capable of realizing high-level decisions made by an upstream, behavioral layer (long-term objectives) and also performs (reactive) emergency obstacle avoidance in unexpected critical situations. system inputs or curvature to be polynomials. cost functional is compliance with Bellman’s principle of optimality. making the best compromise between the jerk and the time. not limited to a certain function class, the problem becomes highly complicated and can be solved numerically at best. A quintic polynomial through the same points and the same time interval will always lead to a smaller cost. 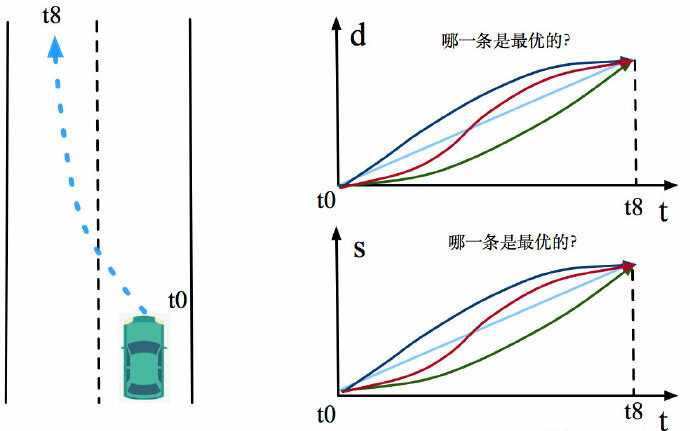 at high speed, d(t) and s(t) can be chosen independently. calculate its coefficients and T minimizing. if not, check and find the second best and collision-free trajectory. at low speed, we must consider the non-holonomic property (invalid curvatures) of the car. cost function: see in the paper. check aginst outsized acceleration values first. for collison dectection: we add a certain safety distance to the size of our car on each side.